Offer your feathered friends a classic and luxurious home with the Heartwood Skybox Bird House with Verdigris Roof. This square home brings fantastic symmetry to your backyard, while its soft green and white colors enhance your foliage. A durable, cellular PVC square forms this lasting shelter, with a 1.5" diameter entry hole on the front panel for birds to access the unit. A hipped, copper roof completes the roost, its symmetrical shape mimicking that of the home, and its verdigris color enhancing the white of the cellular PVC. This lovely roof adds a stunning look to your garden, while its cast iron finial lends height to the piece. Reinforced tines highlight the roof seams, and overlapping edging on the corners of the home adds even more detail to this adornment. The shelter provides plenty of nesting area for a bluebird or chickadee family, the white color keeping the interior a great temperature for the birds. A 1.5" wide lip around the shelter offers landing and resting spots for your feathered friends, and a panel on the back removes for seasonal cleanings or nest checks. The attached mounting collar makes it simple to display this home on a 4 x 4 post (not included). The cellular PVC body keeps the abode beautiful and usable for many seasons without rotting, cracking, or warping, while the soft green and white tones lend a timeless hint to your setting. 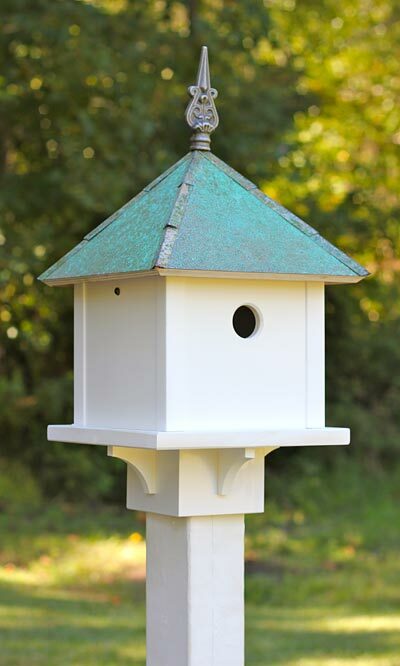 Add bold angles and lovely style to your bird garden with this Skybox Bird House with Verdigris Roof. Some assembly required. Made in the USA.